Ok, this dish makes me feel like I'm cooking like a "real chef." Just call me an ameuter chef geek. 1. Preheat oven to 475ºF. Make several deep, diagonal cuts into the smoother, rounder side of each chicken breast. In a small bowl, combine the garlic, herbes de Provence, salt and 2 tablespoons of the oil. Brush mixture on chicken. 2. Place an ovenproof skillet over high heat. Pour in the remaining 2 teaspoons oil and add the chicken, cut side down. Cover and cook for 5 minutes. Uncover, flip chicken, and slide skillet into preheated oven. Cook for 10 minutes, or until no longer pink and the juices run clear. 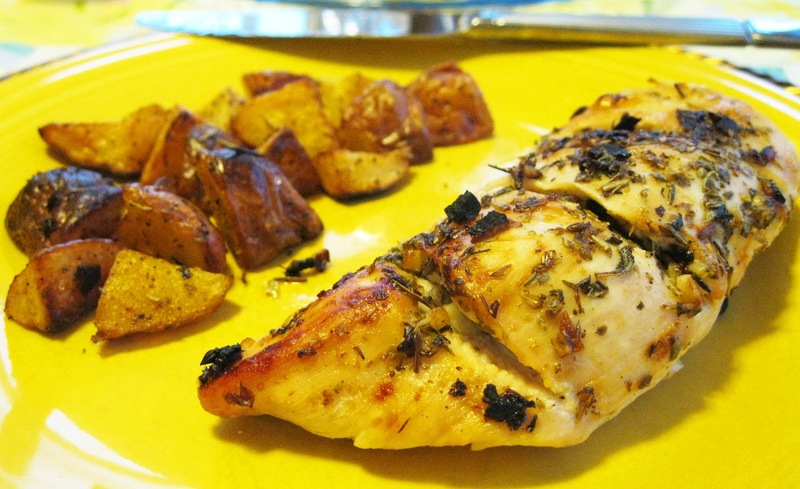 Cut chicken diagonally into slices or serve whole. I've always served the whole piece, but there usually is just a little too much for one person. Next time, I will go ahead and cut into pieces.